Above: A view of the Carenage from Fort George. 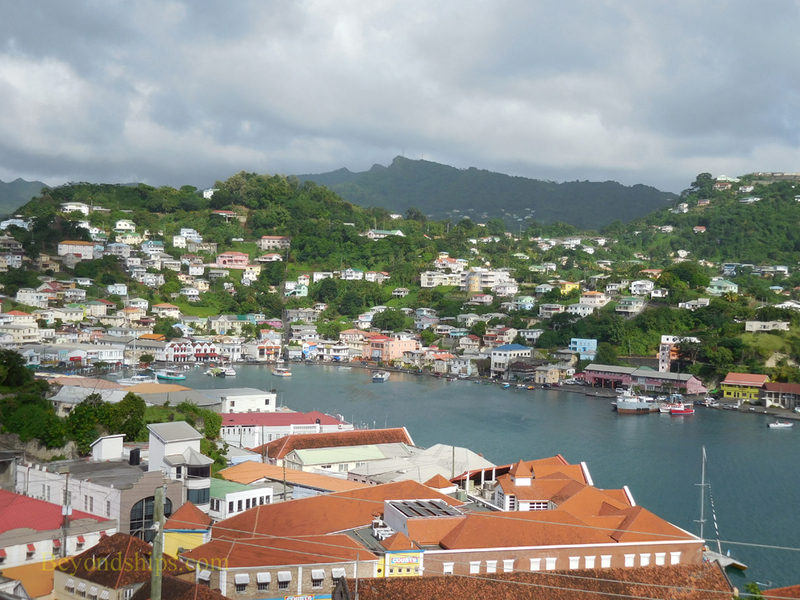 St. George is Grenada's capital and only urban center. It is located on and about the remains of an ancient volcanic crater. The center of the crater has become flooded and now contains a horseshoe-shaped harbor known as the Carenage. The original colonial settlement was here but over the years the town has grown so that it covers the remaining slopes of the crater and over onto the other side. 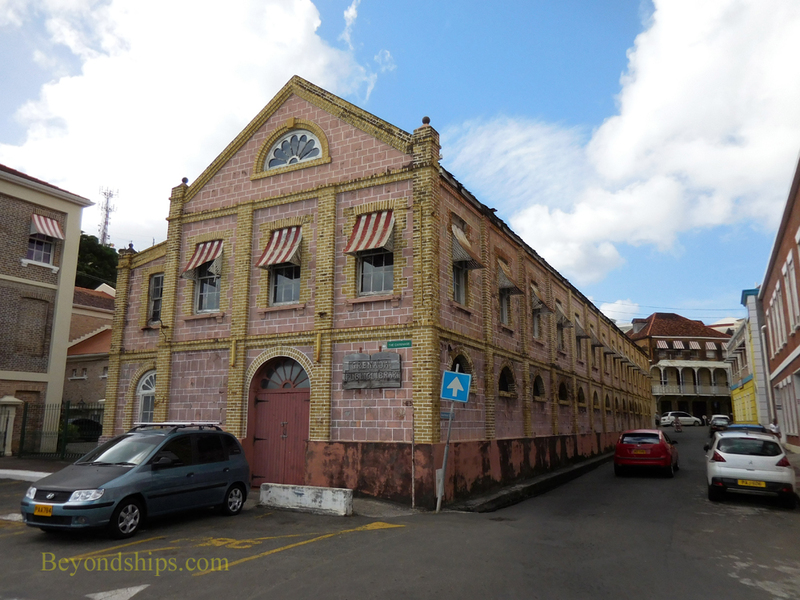 Today's town, especially in the Carenage area, still has many 19th century colonial era buildings. A scattering of more recent buildings is mixed in between. Overall, St. George does not look as prosperous as some of the more popular Caribbean cruise ports but neither does it have the look of extreme poverty as in some other ports. 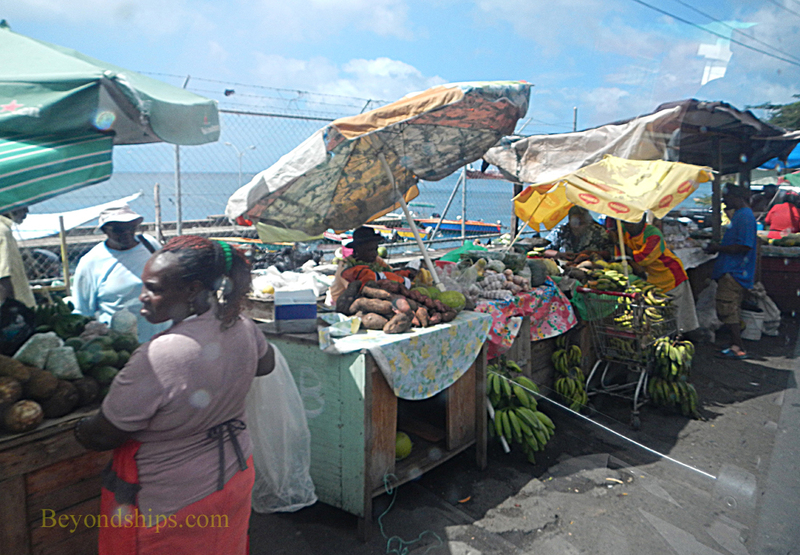 The Market Square is an open air market not far from the Melville Street Cruise Terminal. Here, locals sell spices, fruits, food and crafts. It is often crowded and busy. The vendors can be quite determined in selling their wares. Most visitors going to the Carenage from the cruise terminal go through the Sendall Tunnel. Bored through the slopes of the volcanic crater, the 350 foot long tunnel was considered a major engineering triumph of the 19th century. It opened in 1894 and was named after the then-governor Sir Walter Sendall. The Sendall Tunnel can be somewhat daunting. It is dimly lit and the pavement is uneven. In addition, the narrow tunnel is sometimes open to automobiles as well as to pedestrians. On the other side of the tunnel, you come into the Carenage. Here, there are a mix of colonial and government buildings. The Grenada National Museum has exhibits relating to Grenada's history from the Pre-Columbian era to today. The main attraction, here, however, is the pretty harbor. Small boats load cargo and fishermen make their preparations. Around the harbor are open-air cafes, shops and art galleries. The statue of Christ of the Deep was given to the island in thanks for help in rescuing passengers from a shipwreck. On the high ground overlooking the Carenage are two forts. Both are open to the public. Fort George is the one closest to the cruise terminal. Instead of going through the Sendall Tunnel, visitors climb the stairs next to the tunnel entrance up the steep hill. 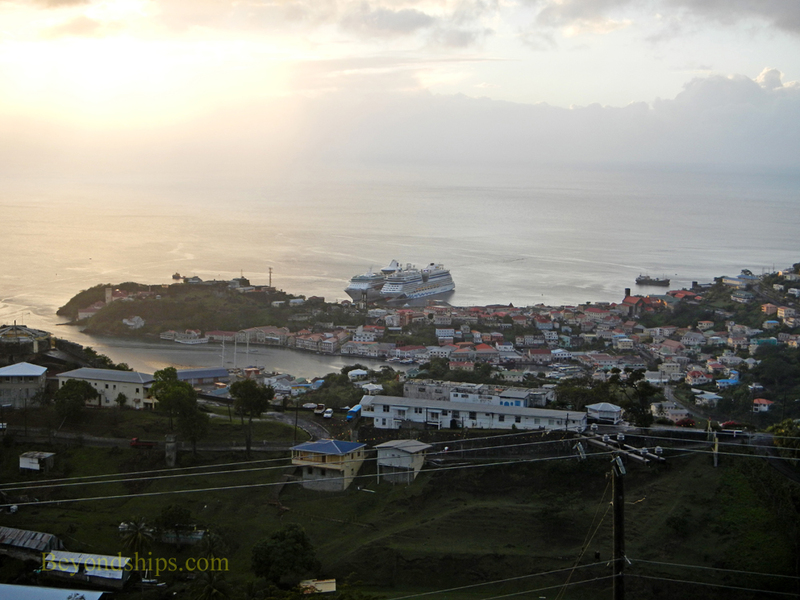 Those making the climb are rewarded with panoramic views of the cruise port on one side and of the Carenage on the other. 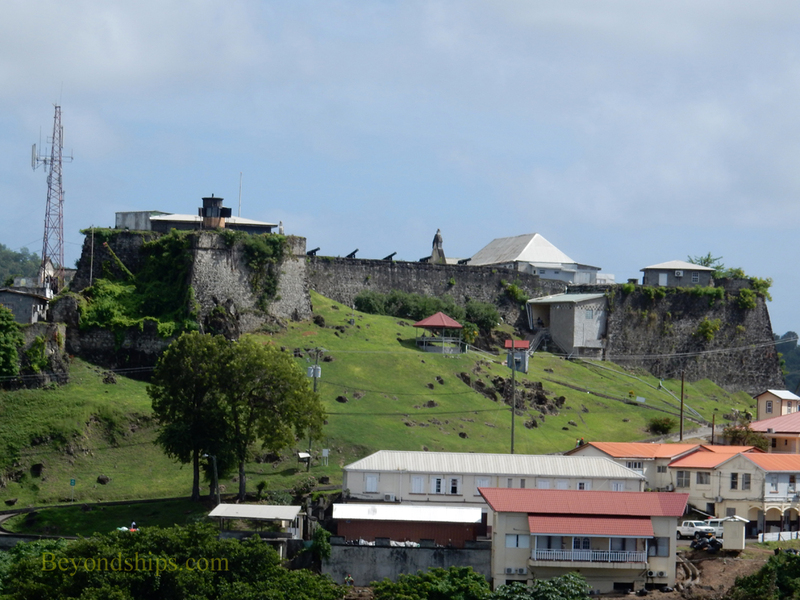 Built in 1705 by the French to replace an earlier wooden fort, Fort St. George has massive stone walls. 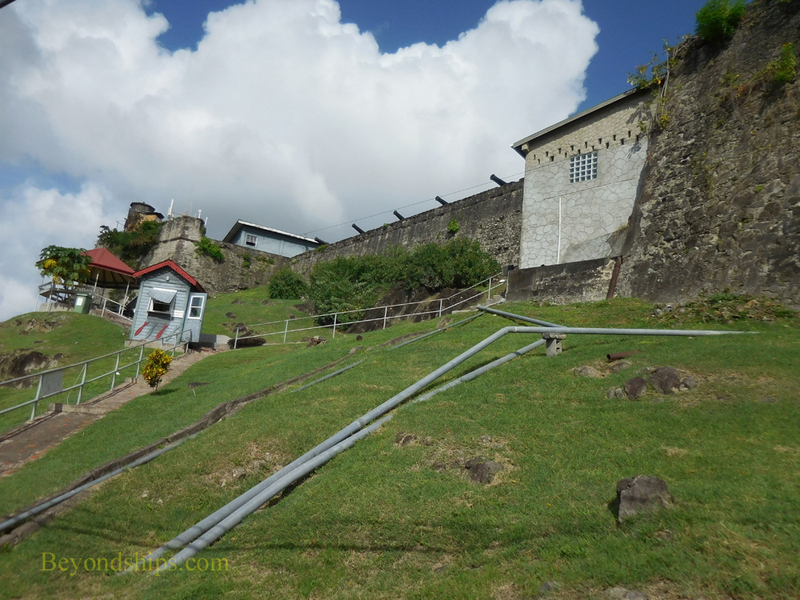 Today, a portion of the fort is used by the Royal Grenada Police Force but much of the fort is open to visitors. Today, visitors can wander around the battlements and massive stone walls. However, the chief reason for going is its birds-eye view of the Carenage, the cruise port and the ocean beyond. 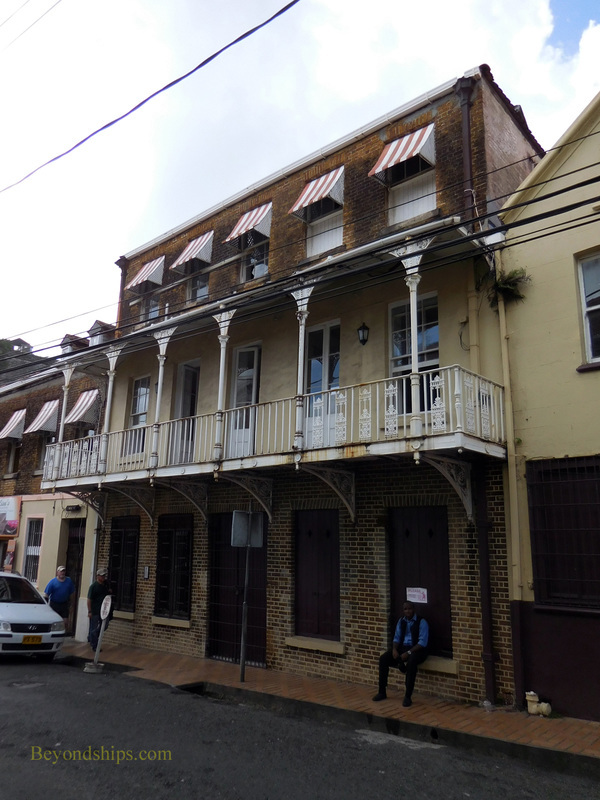 Above: Colonial era buildings in St. George. 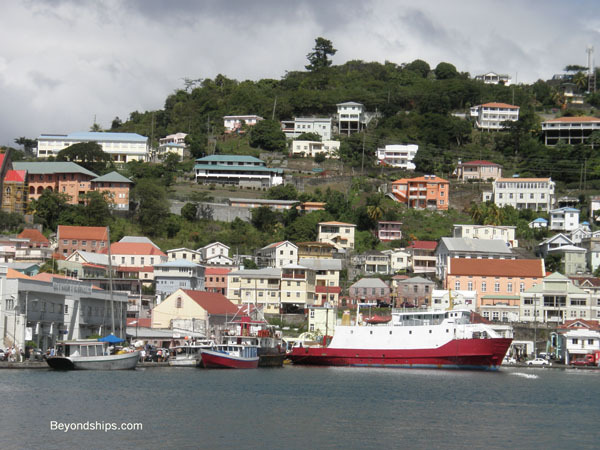 Below: The Carenage is a busy harbor. Above and below: Fort George. 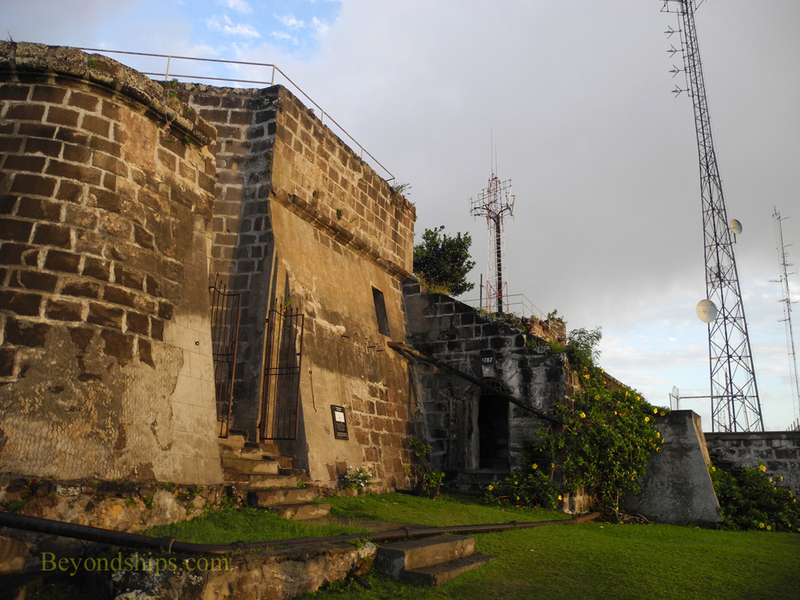 Above: The battlements of Fort Frederick. Below: A view of St. George from Fort Frederick.